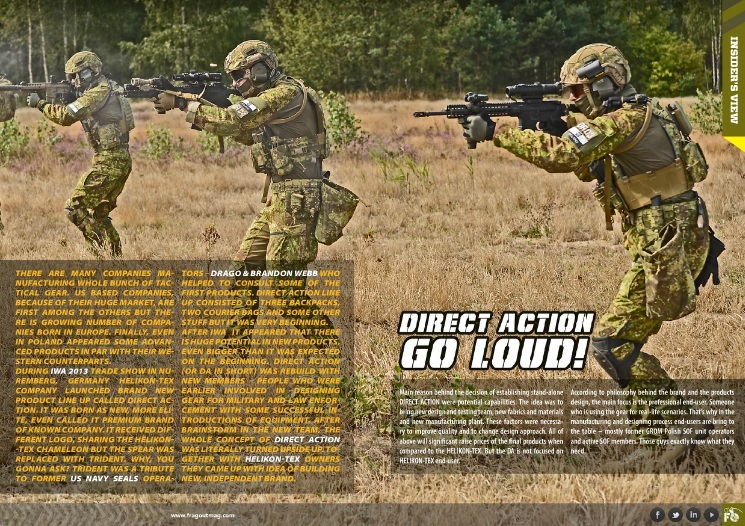 Check out the up-close look at PenCott gear from Direct Action in the latest English-language international edition of Frag Out! magazine. Look closely and you’ll see lots of cool new kit that’s coming from Direct Action. 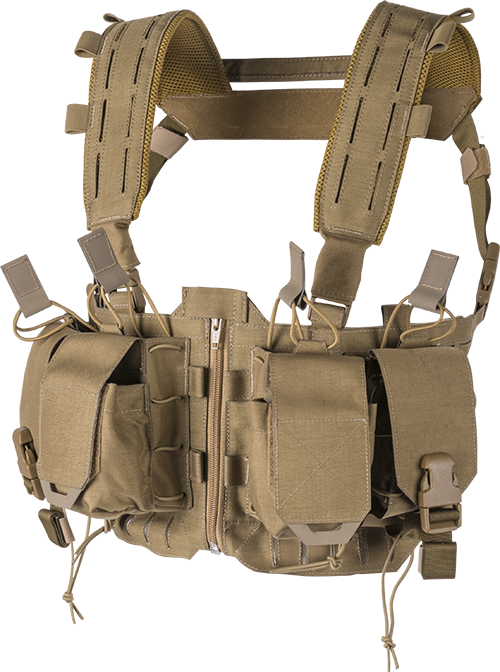 Our friends at Direct Action Gear recently provided a sneak-peak of their latest products – the ‘Spitfire’ Plate Carrier and the ‘Hurricane’ Chest Rig. The FULL line of Direct Action gear and clothing will be revealed at EnforceTac & IWA in March. In the meantime, the current range of Direct Action backpacks and messenger bags are available from a wide range of retailers. Check the Direct Action website for more details. The Direct Action® website, Facebook page, Twitter account and YouTube Channel went live today. 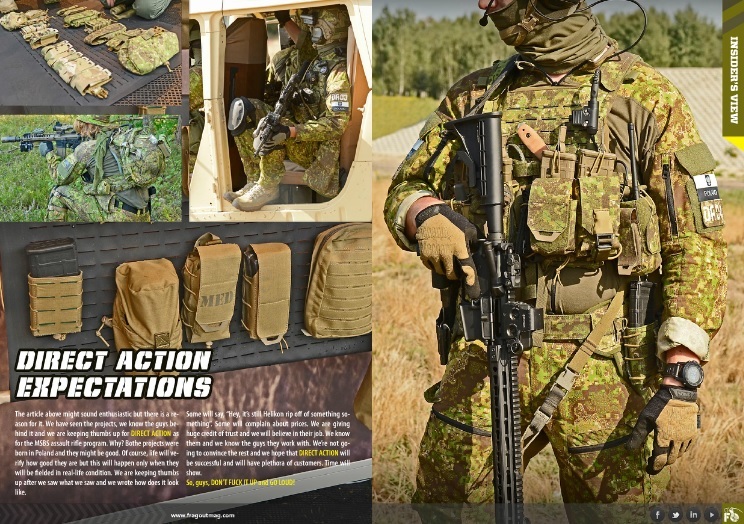 The full Direct Action line consists of a head-to-toe system of head-gear, garments, load-carrying equipment, gloves and boots – all available in a range of solid colors and camouflage patterns, including the PenCott™ family of camouflage patterns from Hyde Definition™. You might have heard about or seen the first prototypes of the Direct Action® line of professional gear during the IWA trade fair in Nuremberg, Germany in March 2014. 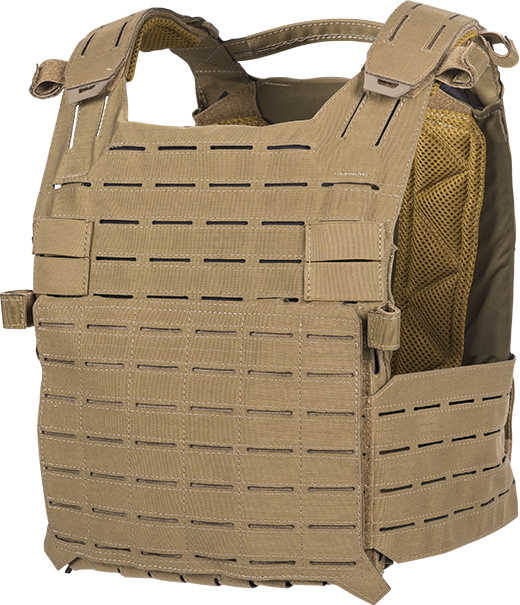 Over the next months, interest in the Direct Action® line grew quickly – especially among special operations forces units. Building on that interest, and the potential that new technologies offered, Helikon-Tex® quickly turned what had begun as a project into a fully-functioning independent brand with a dedicated team of design and production professionals. Leveraging the over 30 years of experience of Helikon-Tex®, over the next few months the Direct Action® team established a new R&D, built a strong professional team of designers, prototype makers and production specialists to create a range of products for the Direct Action® brand. 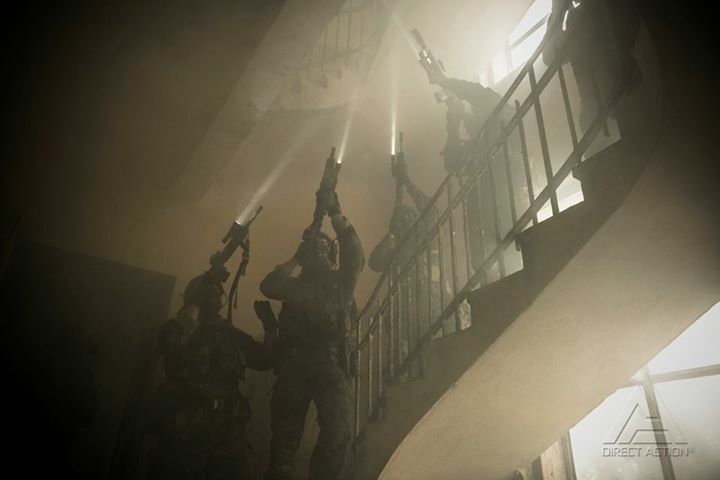 All of the gear they designed, after initial in-house testing, was then fielded to special operations units for end-user trials and evaluations. Their input and suggestions were critical and were incorporated into the final designs at a speed never seen before in the Polish defense industry. 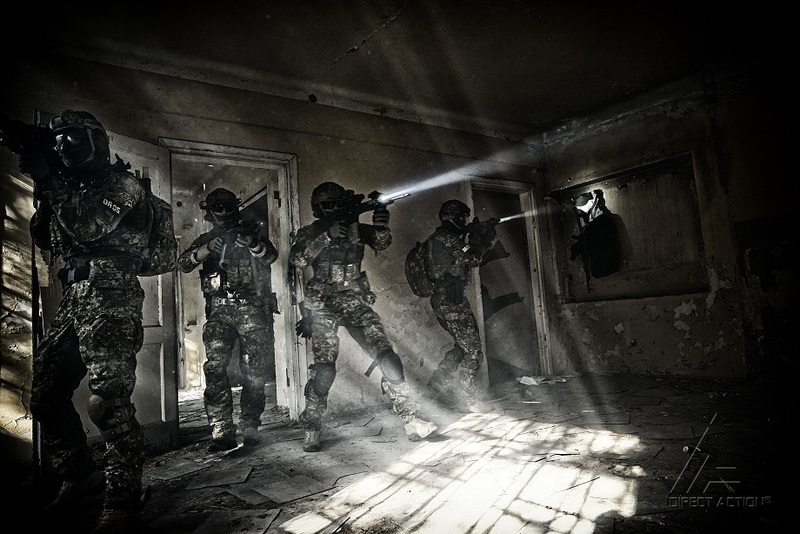 The gear that’s been created under the Direct Action® brand combines the strengths of the team: knowledge of newest tactical gear trends and solutions, experience in clothing and gear design, and close ties to professional end-users. 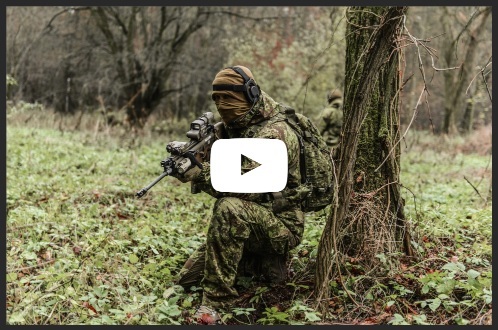 As a result of this close cooperation with end-users, the Direct Action® team immediately began to receive orders from Polish special operations units as soon as the final gear designs were ready. The team’s depth and breadth of design and production experience also drove them to give the DA gear a distinctive “look-and-feel” – and to create a brand where each and every element of the system interfaces with the other components. This combination has created an “individual-as-a-system” approach that is open and flexible with all necessary options, yet remains streamlined and avoids over-burdening. The Direct Action® Team wanted to make sure that they would deliver the best gear possible. They understand how gear is used, they understand the purpose it needs to serve, and how the quality of what they make is fundamental to the effectiveness and safety of the user. To put it simply, Direct Action® is designed, tested and used by professionals. Follow Direct Action® on Facebook for all the latest news and updates, watch their YouTube Channel for promotional and product-spotlight videos and check out their web site for full product and dealer info.